toppov has no other items for sale. WAKEE MIDI DENIM SKIRT WITH FADED LOOK IN LIGHT BLUE. SIZE 6-16. 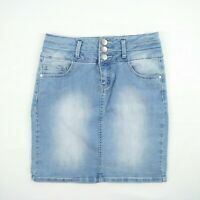 WAKEE BLUE DENIM SKIRT WITH FADED FEATURE. SIZE 6-16. Immediate payment of GBP 20.00 is required.